After five straight sessions of higher closes, the pullback rally on the daily bar chart pattern of SPX 500 failed to overcome resistance from the ‘support/resistance’ level of 2600 and closed slightly lower. 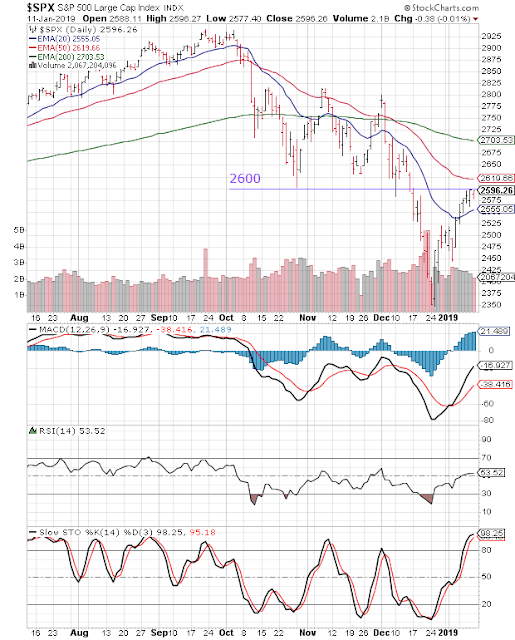 The index closed above its 20 day EMA with a weekly gain of 2.5%, but is trading below its 50 day and 200 day EMAs in a bear market. The sharp ‘V’ shaped rally from the Dec ’18 low is typical of bear market rallies. The sliding volumes during the rally is an indication that the rally has probably run its course. Daily technical indicators are looking bullish. MACD is rising above its signal line in bearish zone. RSI is moving sideways just above its 50% level. Slow stochastic is well inside its overbought zone, and can trigger a correction. On longer term weekly chart (not shown), the index closed well above its 200 week EMA in long-term bull territory, but remains below its falling 20 week and 50 week EMAs. Weekly technical indicators are in bearish zones. MACD is inside its oversold zone, but has stopped falling. RSI has bounced up sharply from the edge of its oversold zone. Slow stochastic has emerged from its oversold zone. 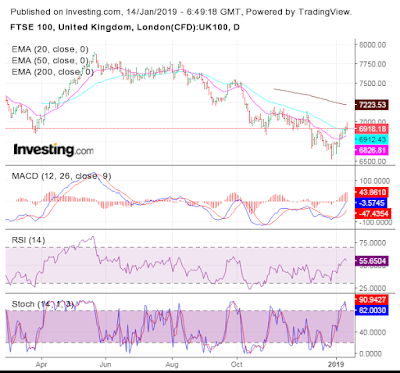 The pullback rally on the daily bar chart pattern of FTSE 100 rose above its 50 day EMA and the 7000 level, but the formation of a ‘reversal day’ bar (higher high, lower close) on Fri. Jan 11 may have brought the rally to a close. Daily technical indicators are bullish. MACD is rising above its signal line and looks poised to enter bullish zone. RSI has moved above its 50% level. Stochastic is correcting inside its overbought zone, and can trigger a correction. On longer term weekly chart (not shown), the index continued its recovery from its 2 years low (touched on Dec 27 ’18) to close above 6900. It remains below its three weekly EMAs in long-term bear territory. Weekly technical indicators are in bearish zones. MACD is ready to cross above its falling signal line inside its oversold zone. RSI and Stochastic are rising towards their respective 50% levels.